You may know that I’m a big fan of index cards. My system of colored cards I keep in my shirt pocket. I call that half my brain. The other half of my brain, I call Martha. 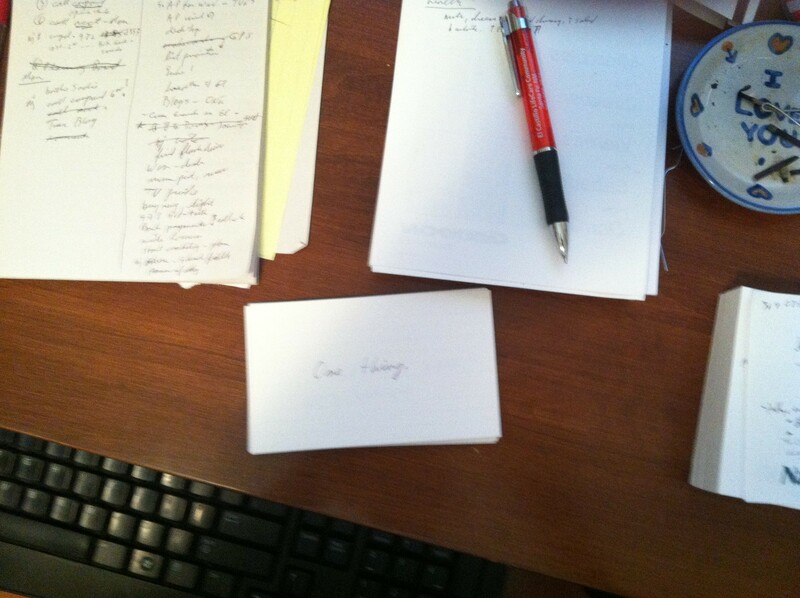 Scott has given me another use of index cards, and I really like it. 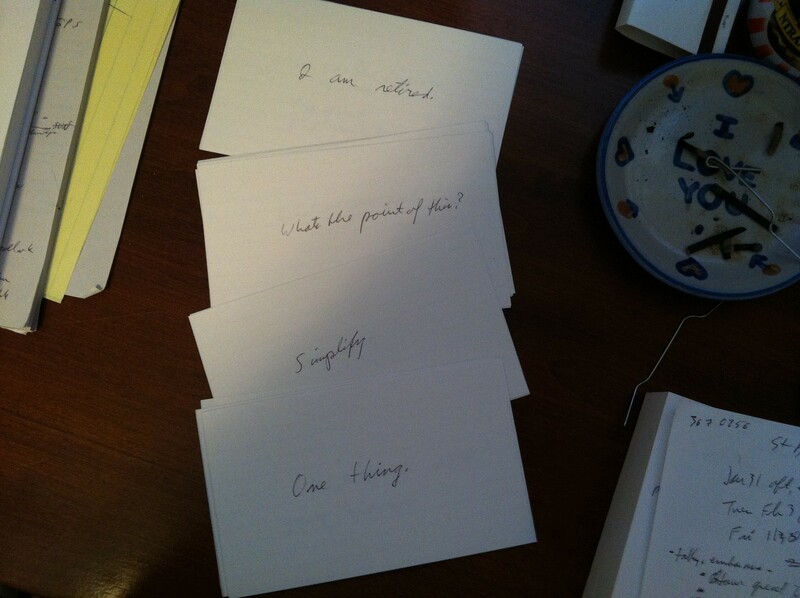 … one thing I’m trying is I have a pile of 3X5 cards with quotes I have collected on them. Each day or so I take the card from the top and put it on the bottom, revealing a new quote for the day. 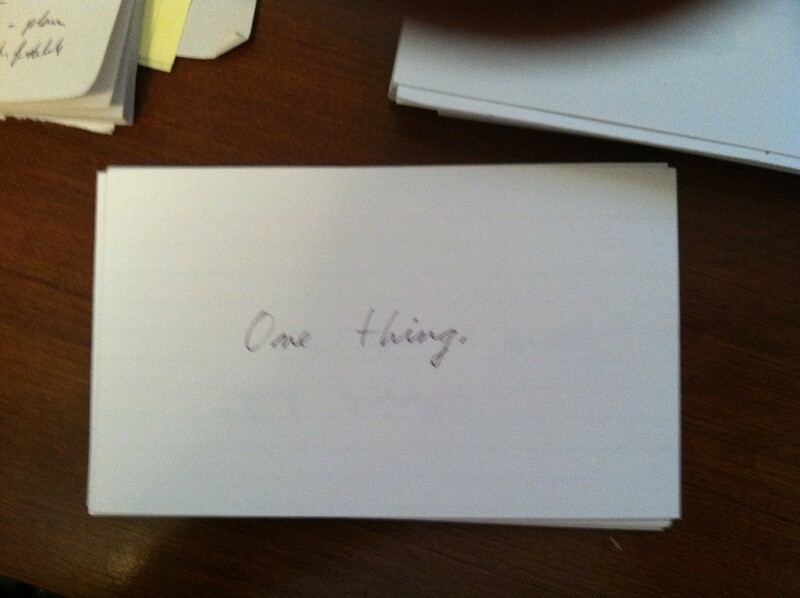 When I find something that works (and remember to do this) I sometimes write it down as if it were a quote and put it in the pile so I will run into it some day in the future. Sometimes that gets me started doing it again. Also, I don’t always put the old card on the bottom of the pile. If it is something I want to run into again sooner I will put it somewhere in the middle of the pile. Mottoes, Tips, Strategies, Prompts, Quotes? I keep the cards on my desk where they’re easily seen. I’m not sure what to call them. Recently I had a week of feeling pressured, overloaded and over whelmed, and that’s when I started using the cards. They have helped. We’ve learned that our brain can generate new brain cells. Yea! So maybe this is a third part of my brain. That’s kind of what I was doing. This entry was posted in add, ADD problems or symptoms, ADD strategies, adhd, ADHD problems, ADHD strategies, dysfunctions and tagged ADD, ADHD, adult add, adult adhd, attention deficit, brain, card, cards, New Year, strategies, strategy, system. Bookmark the permalink. I like it! I love quotes and sayings and find they really do motivate and encourage me. For a while I was writing them on my planner pages. I also included funny stuff that made me laugh. Sometimes you just need to lighten up and laugh. Homey – on your planner pages should work, because I know you look at them many times a day. Did you change or did you just quit doing something that worked? Laughing is great. Think I will try adding that to my cards. “The other half of my brain, I call Martha.” I can understand that! My Daughter actually talks about having a “good brain” and “bad brain.” Sometimes I question the terms, but it works for her and it helps her express whether she’s focused or not. Interesting for one so young, I think. Anyway, I love the card idea. I love quotes and I love calendars or whatever that have them printed right on. But this system with the reminders slipped in is genius – I may just have to try that! lisa – i have to tell you that the other half of my brain, Martha, is my wife. she is the one who is able to remember things.